Amazon Fire TV Cube launched: A hands-free 4K Ultra HD streaming media player with Alexa, allowing you to control your TV from across the room. Today, Amazon announced Fire TV Cube, a hands-free 4K Ultra HD streaming media player with Alexa, allowing you to control your TV from across the room. Fire TV Cube uses multi-directional infrared technology, cloud based protocols and HDMI CEC, that-combined with Alexa-let you control your compatible TV, sound bar, A/V receiver, and cable or satellite box. Power your TV on and off, change the volume, switch to different inputs, and change the cable channel-all with just your voice. Even with the TV off, simply say "Alexa, play Billions on SHOWTIME" and Fire TV Cube powers on your TV and starts playback right where you left off. 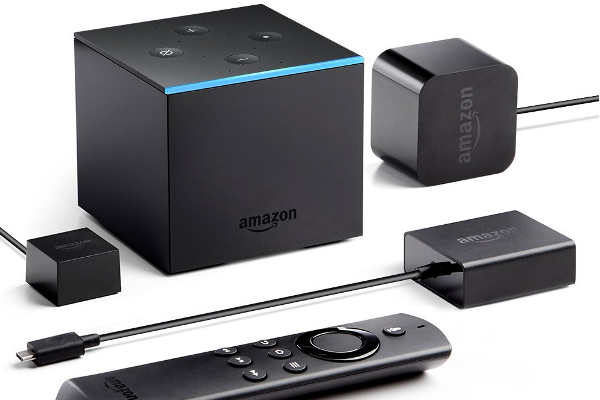 Amazon Fire TV Cube features a simple, guided setup for Alexa voice control of your devices, giving you easy access to the vast catalog of content currently available on Fire TV; including tens of thousands of channels, apps, and Alexa skills, as well as over 500,000 movies and TV episodes and thousands of 4K Ultra HD and HDR titles. Simply ask Alexa to navigate and control content in popular apps, including Netflix, Prime Video, Hulu, ESPN, FOX NOW, SHOWTIME, STARZ, PlayStation Vue, CBS All Access, and NBC. Just say "Alexa, launch Netflix"; "Alexa, tune to CBS"; or "Alexa, find dramas." Fire TV Cube lets you control your live TV hands-free whether it's through your cable or satellite boxes; streaming apps like Hulu and PlayStation Vue; or HBO, SHOWTIME, and STARZ through Amazon Channels. Just say, "Alexa, switch to channel 31"; "Alexa, watch ESPN"; or "Alexa, tune to NBC." With a content-forward user interface, Fire TV Cube makes it easy to find the movies and TV shows you love with a more natural way to navigate and search simply by using your voice, with phrases like "Alexa, find sci-fi movies"; "Alexa, play the trailer"; and "Alexa, show me more results." You can even search for TV and movies by director or actor. Amazon Fire TV Cube is available for pre-order starting today for $119.99 and ships with an IR extender cable and Ethernet adapter beginning on June 21. As an introductory offer, Prime members can pre-order Fire TV Cube on June 7 and 8 for a special price of $89.99-a $30 savings. Plus, for a limited time, customers can pre-order Fire TV Cube and Amazon Cloud Cam together for $199.98 - a $40 savings. Customers who purchase and register their Fire TV Cube by July 1, will also receive a $10 credit for Prime Video. And starting on June 21, Fire TV devices are eligible for unlimited access to tens of millions of songs with Amazon Music starting at just $3.99/month.